The statistics: 61,945 Homeless people in NYC(1), and counting. Most of them are hungry, some of them don’t know where to go, some of them feel lonely and without a hope. But something they all agree is that they want to better their lives. With support everything is possible- And Together we do better. We can mark spots in the maps where we are walking where we see people in need. 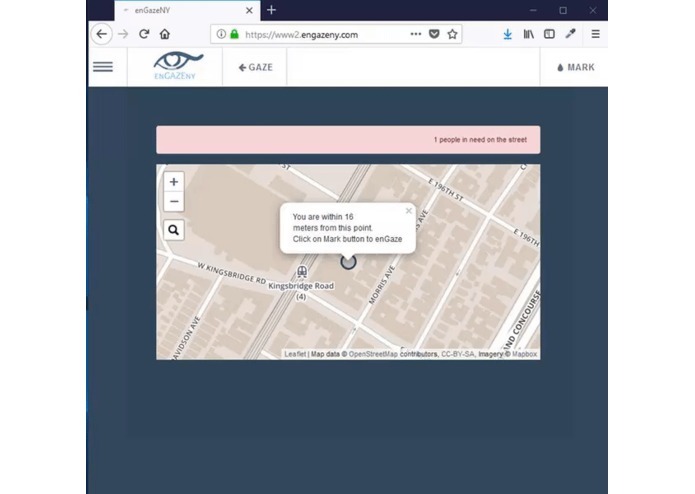 Case 1: User walks and see a homeless person on the street, he can’t help at the moment but he marks the spot with enGazeNY to come back or for others to see. Case 2: User is cooking at home and check enGazeNY, see someone in her area is hungry she brings food to the homeless. We created a server nodejs app with restful api using express. With money generated from audience -network using Facebook tool and grants in the future, we want to create a training center for the homeless. I work on the log in or sign in part for facebook. I placed the leaflet map. Also, I put the drag and drop functionalities for the marker as well as the colors of the marker. In addition, I used the font-awesome icon for the the connect link, I did the survey for the homeless and my partner did the rest.